Tremendous value from one of Europe's leading Box plant growers. Supplied as a pair of Box Topiary ball plants 22-25cm diameter, in 20cm pots. It's hard to beat the sleek and simple lines of well-trimmed quality Buxus balls, adding a smart, modern, yet classic, look to any garden. Whether dressing either side of a classic porch, or in minimalist decking gardens, it's hard to think of another easy to grow, yet versatile plant as god as Box. Totally hardy too, leave them out all year - they look great covered in snow too!! Grown slowly over 4 years, regularly trimmed 2 or 3 times a year to get the fabulous razor-sharp ball shape, they are super-green and fresh, and the centres have none of the brown middle die-back cheaper Box can suffer from. You may buy cheaper, but not better we are sure. The key with Box is not to let them dry out - especially when in full sun for much of the day. Keep the roots cool and well-watered. Trim with sharp shears once or twice a year, and feed with a balanced fertiliser from May to September, applied to the soil. Start thinking of those containers you may put them in now, and take advantage of these very special quality plants. Supplied as pair of 22-25cm diameter, multi-trimmed 4 year old Box balls, in decorative terraplastic planters. Top tip: to avoid the ever increasing Box blight, avoid, cool, wet, damp, shady conditions - grow in sunny, draughty spots, and water the soil in the pot and not the foliage where possible. Box is best clipped in July and August - any earlier and you risk damage from late frosts which can damage soft new growth while any later means that the new shoots are not hardened sufficiently for the following winter. Old, scruffy plants can be clipped to 15-30cm of the ground (6-12in) to rejeuvinate them. 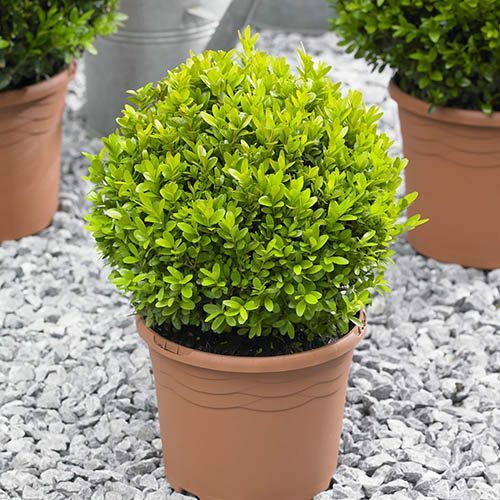 The small leaf size of Buxus means that you can achieve a whole range of topiary shapes and styles with the minimum of experience - box is remarkably resilient. Plant box in autumn or spring in fertile, well-drained soil and keep it watered, especially if grown in full sun. Pot-grown plants can be planted any time of year as long as the ground is not wet or waterlogged. Box will tolerate shade so is great for growing underneath trees and makes superb border edging. Suitable for growing in a wide range of containers, why not try your hand at a range of topiary styles and shapes - it's great as a way to get kids involved with gardening and isn't just reserved for grand estates! Besides keeping plants well-watered, box appreciates a light top dressing with a slow release, general purpose fertiliser such as fish blood & bone in early spring, taking care to avoid the leaves.